Several people who read our cruising reports have expressed an interest in the layout of the boat, so I have added this page in response. 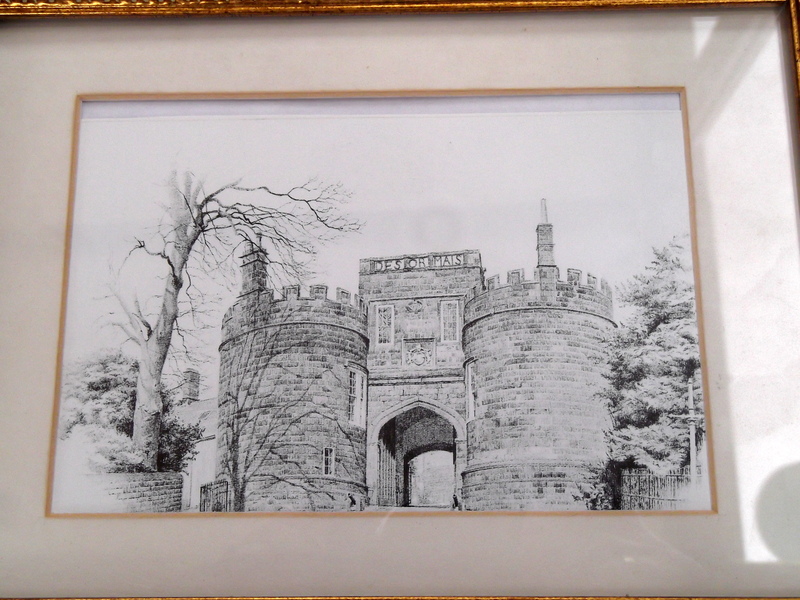 The photographs were mostly taken on the day we went to view Desormais, shortly after which we decided to buy her. I’ve got to say, she’s hardly ever been this tidy since! The word Desormais is French for ‘henceforward’ or ‘from now on’. It’s also the title of a popular song sung by Charles Aznavour, and though I’ve never heard the song in the original, I’ve lost count of the number of times a cheery lockie has gone down on one knee, opened his arms wide and treated us to the first few lines of the song. I feel like I know it by heart! The skyline of Skipton Castle in North Yorkshire, England, has the word crafted into the stonework above the main entrance. Apparently it was the motto of the Clifford family who owned the castle in the 17th century. She’s just over 16m, almost 4m wide, with a Perkins diesel engine (marinised by Sabre) and was built in 2005, acquired by us in August 2007. 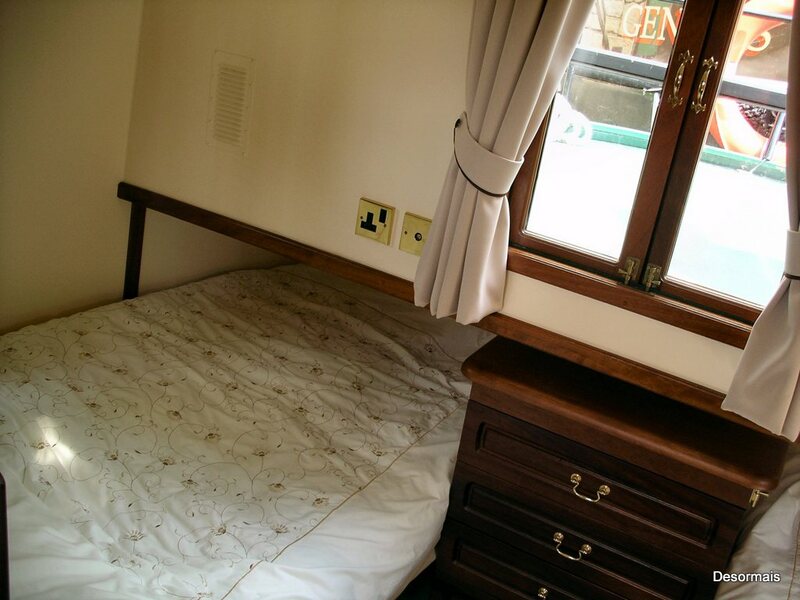 The layout comprises the main sleeping cabin in the bow, with wardrobes, cupboards and drawers, leading into a small bathroom with a three quarter size bath with shower over, loo and handbasin. 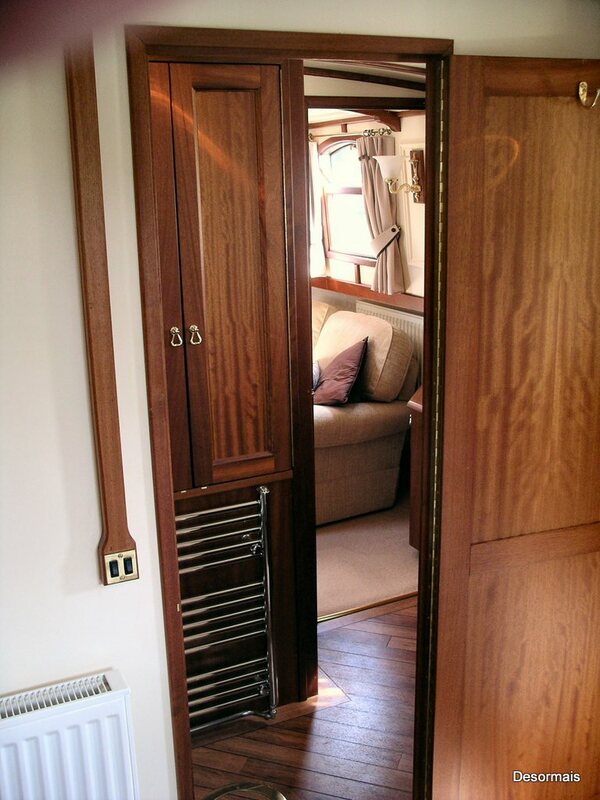 There’s plenty of storage in the bathroom, and a heated towel rail. There are three built in, simple air-cooling systems in this cabin, in the lounge and back cabin. It’s not quite as effective as true air con, but it certainly does reduce the temperature, working off either land-line or generator. The lounge has a diesel bubble stove, which we’ve never used as we have Webasto generated central heating running off diesel, which is more than adequate for our needs. We have spent several weeks on her during the winter months and have been quite warm enough, but it’s not something we do every year. There’s an overhead ‘pigeon loft’ window for additional light and ventilation. The television and video unit are enclosed in a cabinet (we have satellite dish on the roof), and there are a wide range of base and overhead cabinets for storage. 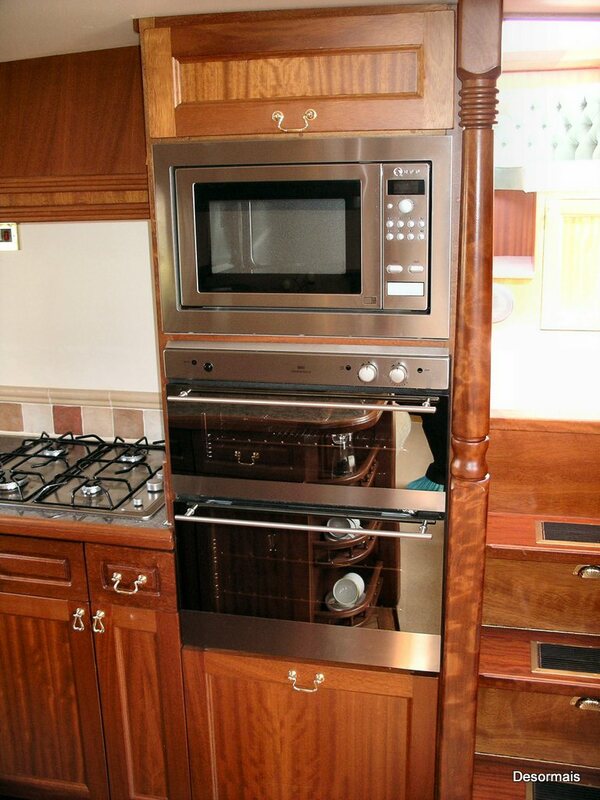 The open plan kitchen has a tower system gas oven, grill and microwave, single drainer sink, fridge, and we’ve put in extra power points in the kitchen area. The floors in the bathroom and kitchen are Amtico. There was a dining table and two chairs at the side of the kitchen, but since we always eat in the wheelhouse we have recently removed these dining arrangements and installed a cupboard to house a small freezer. We tiled the top of this cupboard with (almost) matching tiles to the splashback in the kitchen. There are steps leading up to the wheelhouse, each step having a pull down facer to reveal a shelf for storing things. We use it for wine and beers – it’s never empty. But then again… it’s never full either. 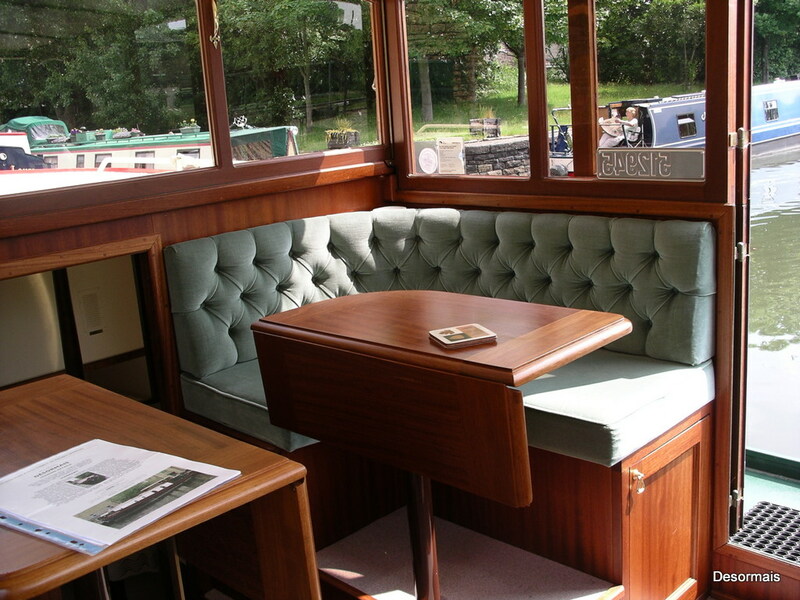 The wheelhouse has cushioned seating, and we have a couple of extra matching bench blocks which we can fit across one exit and the door leading down to the back cabin to form almost a horseshoe round the dining table. There’s a table with drop down leaves. We do most of our entertaining up here, where we can see what’s going on around us. The upper wheelhouse is dismountable, but it’s a lot of work and we’ve only ever taken down once for shipping from England to France. It’s not something you’d tackle lightly. 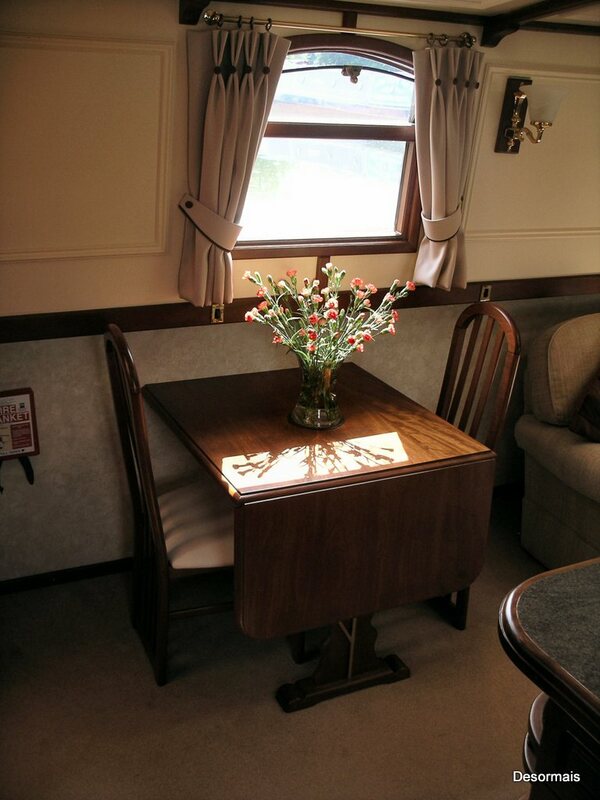 The wheelhouse windows are single glazed, slightly tinted and toughened as a safety measure. Double glazing would make it too cumbersome to dismantle. The large front and rear windows drop down onto the cabin roof for pleasant cruising in hot weather and those long summer evenings. When eating in the wheelhouse during the winter months we usually bring up an electric radiator, for which purpose we’ve installed additional electricity points up there. The front and rear windows drop down – essential for cruising under the hot afternoon sun, and for a cool refreshing breeze during dinner. 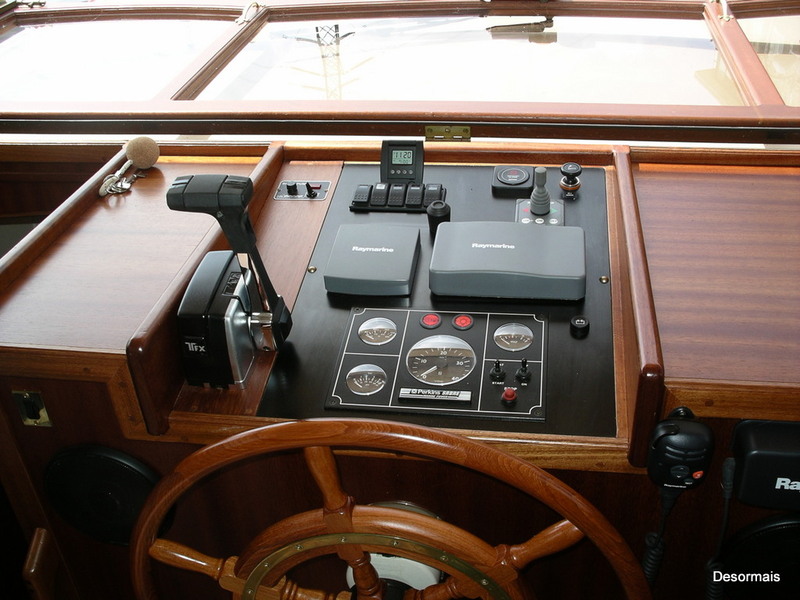 We have Raymarine GPS, rudder indicator and VHF radio on the control panel. We don’t use the VHF radio on the canals, it’s mostly for contacting lockies on the rivers. The guest bedroom, better known these days as ‘the tool shed’. 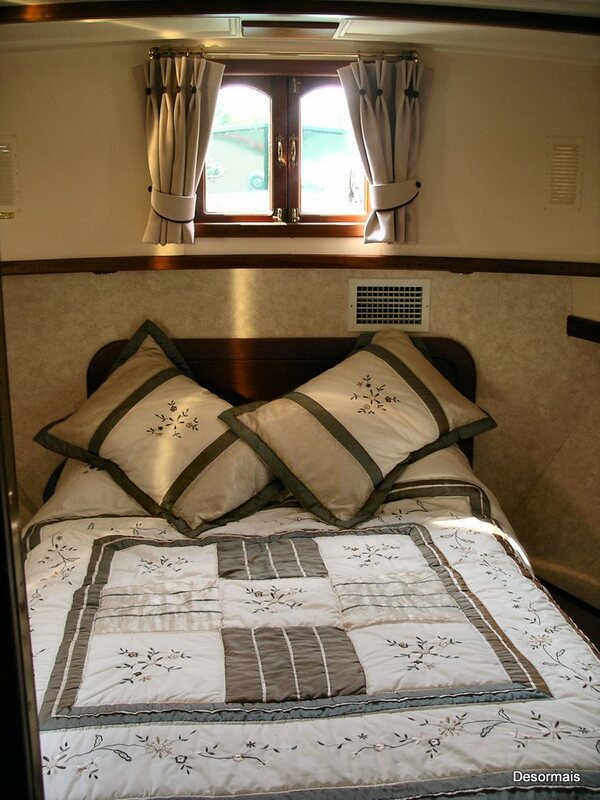 There are steps leading down to the back cabin which strictly speaking is a self-contained guest cabin, with two single beds, a chest of drawers, wardrobe, loo, handbasin and shower cubicle. In reality, it’s our floating shed, with all sorts of things stored on and below the beds. The stairs which lead down from the wheelhouse to the back cabin can be pulled down, (the underside forming another set of steps) to gain access to the engine room, which can also, and more usually be accessed via a trapdoor in the wheelhouse. I use the back steps to access the washing machine which is also housed in the engine room. We used to house the freezer down here, but the temperatures generated by the engine were not conducive to its operation – we’re now on our second freezer. Hot water is generated by the engine, but we have an immersion heater, powered by landline or genny, for days when we’re moored up. The genny is housed in the engine room, and we use it only occasionally when we’ve been mooring wild, or when we’ve been doing short runs insufficient to recharge the batteries. There is a fairly short front deck, beneath which lie the gas locker and the anchor gear, and the rear deck, slightly longer, is where we keep our bikes. There are holders on the back rails into which we can slot sun-shades and a rotary clothes drier. Neither of us are sun-bathers (we think we’ve probably subjected our skins to enough UV whilst living in South Africa and Spain) so we don’t sit out on deck, though it’s possible to do so. Suited and booted for the winter. In 2015 we had matching green covers made to cover the wheelhouse doors/windows, cabin windows and front portholes. The front and back wheelhouse window covers have tapes so that they can alternatively be used for ventilated shade in summer. So there you have it; it’s hardly what you’d call roughing it, I know, and we have friends with more traditional boats that have a charm all of their own. But it suits us, and it’s comfortable. There’s enough space for clothes, books, etc if you adopt an ordered (and minimalist) approach to storage and there’s a whole world of difference between living on a dutch barge and living on a narrowboat as we used to. For me, the wheelhouse makes it. It’s where I write, where we eat, entertain and watch the scenery go by as we cruise. We’re very lucky, we realise that; we’re creating memories to reflect on for the rest of our days. 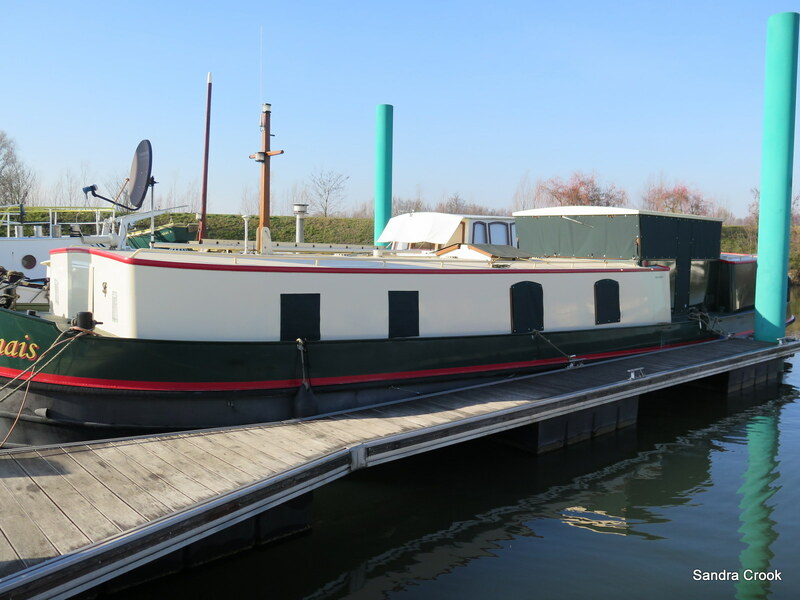 This entry was posted in Cruising in France and tagged ., boat layouts, cruising in France, Desormais, dutch barge, Sagar barges. Bookmark the permalink. I am ready to sign up. Need crew?? Je parle francais et je suis une excellente cuisinere. I very much enjoyed the tour. I can hear the gentle lapping against the hull as I breathe in the sweet blossum breezes and scan some quiet town from the wheelhouse table. I raise my glass to you, Sandra. Thank you so much for sharing. I enjoy reading this, love to continue reading more of your work. Interesting experience…I enjoy the tour of Desormais. Need a crew? 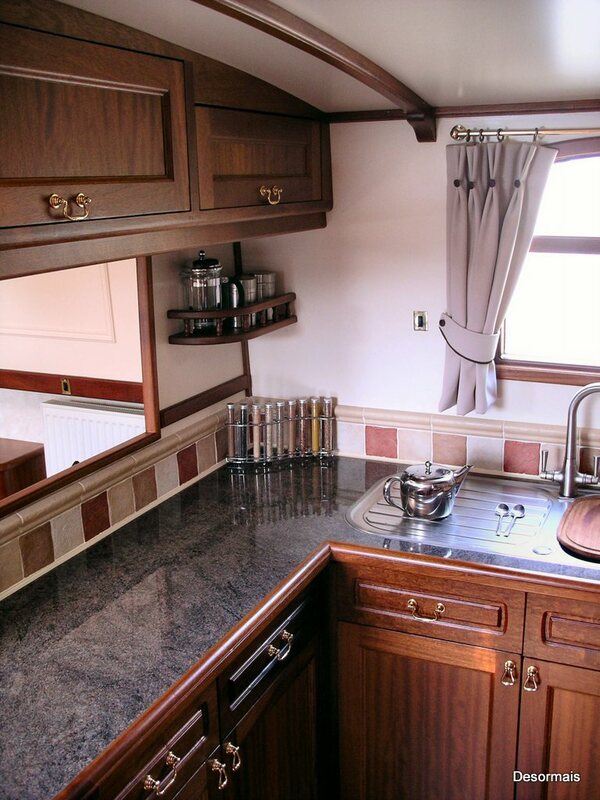 We have had a narrow boat for 4 years – some 1,700 miles of UK canals under our keel and this May traded her in for a new Eurocruiser – 60 x 12 ft – Lilly Pilly has wheel steering, bow thruster and 65 hp engine and all the bells and whistles (not that we wanted a washer/dryer and microwave, but that how she came !!) We are hoping to transport her to europe in October 2015 and then find a secure berth for her for the winter Nov. 15 to May 2016. 1. Which transport company did you use and were you happy with them ? 3. Would you have any info on where we might hope to find a winter berthing for our boat ? Any advice will be warmly received – You have had quite some experience in Europe now, so your input would be very helpful. Congratulations on your new boat! I hope you’ll be very happy on her. The haulage company we used was CPL http://www.cpltrans.com/ and we were very happy with them. We’d use them again. We put her in the water at Migennes which at that time was run by Joe Parfitt, partly because he’d been recommended and also because there weren’t too many cranes about that could lift our weight. Now that company is run by Evans Marine, so you’d need to give them your weight and see if they still have a crane suitable. Can’t remember the costs now, sorry, and it was over eight years ago, so probably not much use anway. Winter berthing should be booked asap – it’s already later than I’d like to be looking. You might be able to berth her at Evans Marine. After that, you could try St Jean de Losne (bit of a journey from your launch point though), or Pont de Vaux (another longish haul). Whatever you decide, I’d get cracking on contacting ports/marinas now. If I have any further ideas I’ll add them on here. I see you’ve asked on the DBA list too, so the members there might be able to help. 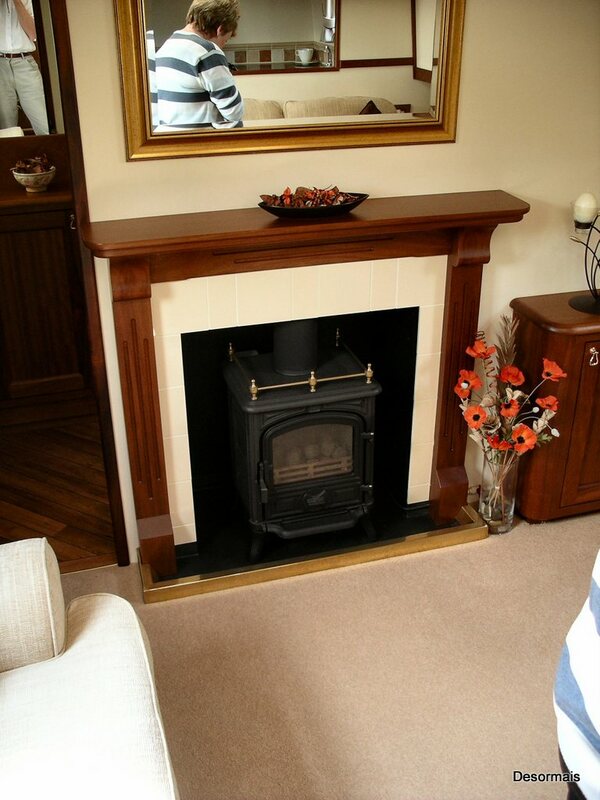 You could look on their Moorings Guide for potential places, it’s on the general forum there. Hope this helps, maybe see you around sometime next year. Sorry, I should have said H2O at St Jean de Losne or Blanquarts. H20 and Blanquarts are at the other end of the Burgundy which starts (or ends) at Migennes. You really need to obtain Navicartes or Breuil maps and spend a lot of time studying them to determine kilometre points and locks between your points of interest. 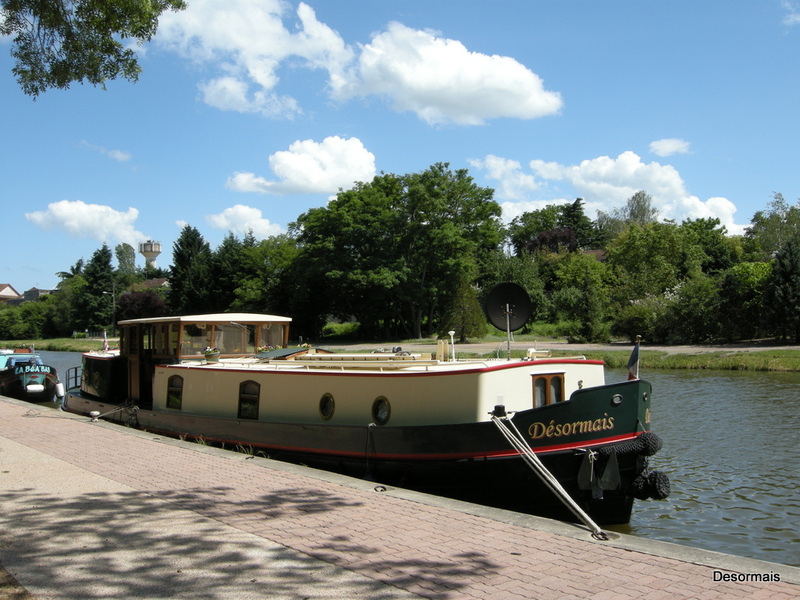 St Jean de Losne is fairly central for exploring the central-northern parts of France with easy access to many canals/waterways from the Saone. This is utterly beautiful, and you are fortunate. May you keep cruising and keep writing! Thank you for sharing this! Your picture tour brings back memories of days when I owned a boat. I loved just being moored somewhere, enjoying the peace without interruption. My piece of heaven. Yes, nothing quite like being moored on a river watching boats of all shapes and sizes going about their business. The canals are quieter, of course, with a charm all of their own, but since we moved the boat from the Canal du Midi up to Pont de Vaux, we’ve spent a lot more time on the rivers.